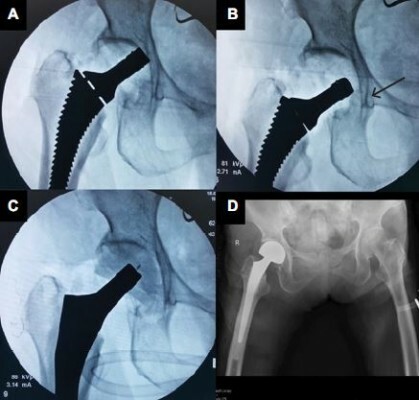 Introduction: The early rehabilitation and mobilization after hip arthroplasty (HA) in elderly femoral neck fracture (FNF) patients significantly reduces the postoperative morbidity and mortality. The direct anterior approach (DAA) without the muscle detachment has been shown to improve the early postoperative functional outcomes in coxarthrosis patients. However, the application of DAA on elderly FNF and the most suitable surgical technique have rarely been investigated. This study aimed to report the short-term outcome after our anterior-based muscle-sparing approach (ABMS) in elderly FNF. Materials and methods: A prospective study, in 40 elderly unilateral FNF patients who underwent HA with ABMS, was conducted. The primary outcomes were hip flexion and abduction power at each follow-up period. The contralateral muscle power, measured at 3 and 6 months, was used as the control value. The perioperative data and complications were recorded. Results: Thirty-two patients underwent bipolar hemiarthroplasty (BHA), while eight other patients received total hip arthroplasty (THA). The hip abduction power returned to control value at 6 weeks (99.0%±6.1%; 95% CI: 86.1–111.8). The hip flexion power returned to control at 3 months (108.5%±5.6%, 95% CI: 96.8–120.2). No iatrogenic nerve injury was found. The intraoperative femoral fracture (IFF) was found in 7 patients (17.5%), and was significantly related to the early period of learning skill (first 11 cases; p<0.01). BHA had nonsignificant higher IFF than THA (8 vs. 0; p=0.31). Conclusion: After ABMS, the hip muscle could recover to the baseline value within 3 months without iatrogenic nerve injury. The ABMS-related complication, which was IFF, could be significantly improved with the learning skill. The adequate posterior soft tissue release and gentle manipulation of the hip joint might play important roles for IFF prevention. BHA might relate to higher risk of IFF because of difficult reduction from large femoral head diameter.